I like the early games. We win by noon and have the rest of the day to hang out (or watch more football). Anyway, since we cancelled our cable we have gone to Rookie's to watch the Michigan games this season [except for the Notre Dame game, when we were at THE BIG HOUSE]. 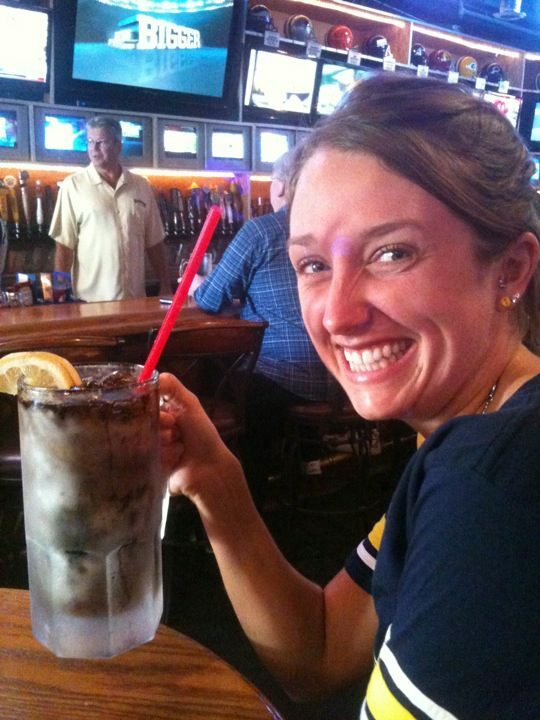 They have really gotten to know me :) This morning our waitress brought me over an EXTRA LARGE Diet Coke with lemons (without me even asking) in a FROSTED MUG! The mug was the size of my head! I think it is 34 ounces. And hurt my wrist to actually lift it up. Ryan just had to take a picture because we chuckled about it when she brought it over. And yes, by the end of the game I had gone through two of them (with Ry helping me out a little :) ).